Concrete is everywhere. It is in the foundation of your home, the driveway you park on and the pathways you walk along. Concrete is the most used construction material in the world. It is extremely durable but that doesn’t mean it will last forever. That is especially true when you want to replace a driveway or makeover a patio. Whether you’re busting up that concrete or your contractor is, you need to find a reliable way to get rid of it without any complications. Enter Junk King Jacksonville. These are the professional junk haulers who can make your pile of concrete disappear in no time at all. The main issue dealing with concrete hauling is weight. Those chunks of concrete are going to be a challenge to lift a load if you’re not use to that kind of work. Fortunately, the Junk King crews have plenty of experience with heavy lifting and they’ll do all that work for you. Your back will never be put at risk with Junk King on the job. Weight is another factor with disposal; at least it is with some so-called professional junk haulers. These are the companies that charge by the pound. The reason they do this is that is how they’re charged when they dump what they collect in a landfill. Junk King Jacksonville avoids the landfill, which means they avoid the hefty charges. It also means they won’t be charging you by the pound. That is going to make a huge difference for the final price. Junk King only charges a flat rate based on how your stuff will be packed onto the truck. The goal for the Junk King crew is to pack everything up tight so that they can make several pickups during the day. That means you’ll be paying the low end of the price scale. 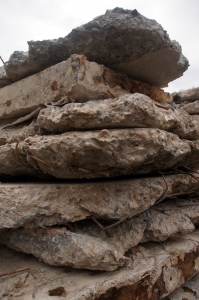 After all your concrete has been loaded, you can call on the Junk King crew to clear away the rest of your clutter. Put that team to work clearing out the rubbish in your garage and closets. What a difference that can make! You can always count on Junk King Jacksonville to take care of your concrete hauling and rubbish removal fast. This entry was posted in Jacksonville junk removal and tagged concrete hauling, Junk King, junk removal on October 31, 2017 by Junk King. Last updated November 1, 2017 .